September was Childhood Cancer Awareness Month. I'm guessing that most of you didn't know that. That is, unless you know me personally. I've been spreading the word every chance I get. The logo, above, has been my profile pic on Facebook for about the past 6 weeks. The reason I feel so strongly about this, is due to the death of our 18 year old nephew in May of this year. Matthew battled ALL (one of the types of leukemia) for 20 months. Tomorrow will be the 5 month anniversary of his passing. When I say that Matthew battled....he fought hard. He was truly an inspiration! His motto was "Play hard...never give up". And, he lived that motto to the very end. You can see a photo of Matthew in the left hand column of this blog. He's the handsome young man in the helmet. I really don't want this blog post to be depressing. But, unless a child in your family has fought cancer, you can't know how devastating it can be to the entire family. We all recognize the pink ribbons for Breast Cancer Awareness, not just in October, but throughout the year. But how many people are aware of what the Gold ribbon means? Why does the media not devote coverage to Childhood Cancer Awareness? I wish I knew the answers. You can follow the link to find more information, but I would especially like for you to read the following statistics from their site. I think you'll be surprised by these facts. • Childhood cancers are the #1 disease killer of children. • The National Cancer Institute’s federal budget=$4.6 billion. Pediatric cancers received less than 3% of it. • Overall, one out of every five children diagnosed with cancer dies. In some forms of cancer, as few as one out of every five children will live.• Childhood Cancers are cancers that primarily affect children, teens, and young adults. • Approximately 20% of adults with cancer show evidence the disease has spread, yet nearly 80% of children show that the cancer has spread to distant sites at the time of diagnosis. • The cause of most childhood cancers are unknown and at present, cannot be prevented. (Most adult cancers result from lifestyle factors such as smoking, diet, occupation, and other exposure to cancer-causing agents). 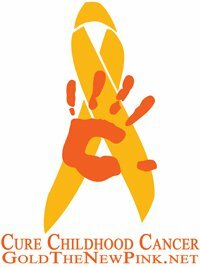 • Nationally, childhood cancer is 20 times more prevalent than pediatric AIDS yet pediatric AIDS receives four times the funding that childhood cancer receives. • On the average, 12,500 children and adolescents in the U.S. are diagnosed with cancer each year. • In the U.S., about 46 children and adolescents are diagnosed with cancer every single school day. I hope that you've read all the way to the end of this post. This cause is something near and dear to my heart. I want so much to see a search for the cure of all childhood cancers. CureSearch is trying to do just that. It's an excellent organization and you might want to consider contributing to their fight for the cure. Wonderful Susie. Keep spreading the word. It is going to take all of us to get this to everyone. It was a grand pleasure meeting you yesterday. I'm so sorry for the loss of your nephew! I did not know that September was childhood cancer month. Thank you so much for sharing the details. I will add this cause to my prayers!